Nearly 13% of women experience depression during pregnancy and the rates after delivery are even higher. In a newly published journal issue of Birth Defects Research: Depression and Its Treatments during Pregnancy, studies take a closer look at maternal depression, its effects and the effects of various treatments of the disease on a developing baby with one study showing newer medications may be safer choices. While the issue includes studies reviewing selective serotonin reuptake inhibitor (SSRI) use during pregnancy, one article led by Asher Ornoy, MD, the special issue’s co-editor who is a physician and researcher at Hebrew University Hadassah Medical School in Jerusalem, focused on the outcomes of pregnant women who used non-SSRI medications to treat depression. 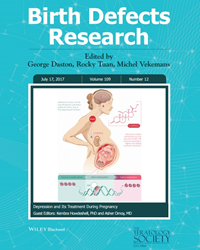 In their contribution “Antidepressants, antipsychotics and mood stabilizers in pregnancy: what do we know and how should we treat pregnant women with depression,” Dr. Ornoy and colleagues found that specific non-SSRIs, tricyclic and tetracyclic drugs, appear to be safe, while some mood stabilizers, such as lithium, valproic acid, carbamazepine and topiramate lead to birth defects if used during pregnancy (DOI: 10.1002/bdr2.1079). “We did find that newer antiepileptic drugs and mood stabilizers, such as lamotrigine and levetiracetam, do not appear to cause higher rates of birth defects,” said Dr. Ornoy. “They also did not appear to cause higher rates of neurodevelopmental alterations which is very encouraging,” he added. Other topics covered in the issue include the role of serotonin in early brain development (DOI: 10.1002/bdr2.1085) and how SSRIs might alter it leading to possible long-term effects, and a review of antidepressant use during breastfeeding (DOI: 10.1002/bdr2.1077) and how most psychotropic medications that reach an infant through breastmilk don’t appear to have any effect on the baby. It also includes an article describing the epigenetics of clinical depression (DOI: 10.1002/bdr2.1081) and how the monitoring of certain genes may help to identify these non-DNA-coding changes to gene expression that are associated with life-long behavioral alterations in offspring of women diagnosed with clinical depression during pregnancy. The Teratology Society, an international professional group of scientists hailed as the premier source for cutting-edge research and authoritative information related to birth defects and developmentally mediated disorders, publishes Birth Defects Research with John Wiley & Sons. The Teratology Society is made up of more than 700 members worldwide specializing in a variety of disciplines related to birth defects research, including developmental biology and toxicology, reproduction and endocrinology, epidemiology, cell and molecular biology, nutritional biochemistry, and genetics as well as the clinical disciplines of prenatal medicine, pediatrics, obstetrics, neonatology, medical genetics, and teratogen risk counseling. Scientists interested in membership in the Teratology Society are encouraged to visit http://www.teratology.org. For more information on depression and the known effects of its treatments during pregnancy and while breastfeeding, please visit MotherToBaby and the March of Dimes. Media Contact: Nicole Chavez, 619-368-3259, nchavez(at)teratology.org.